I'm a big fan of TOMS Shoes. 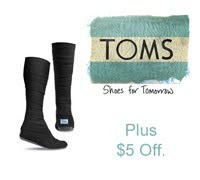 For every pair you purchase, TOMS will give a pair of shoes to a child in need. Pretty awesome. Vegan Wrap Boots for Fall! Not only does TOMS do a world of good for tiny feet in need across the globe, but they also have a few beachy-urban-chic vegan shoe styles. I've already ordered my vegan boots for fall, they look super cozy and sleek. Find Vegan TOMS Shoes! in the feel-good-while-you-shop online store.